Photo taken by the lovely Abby Camarata of Bump 2 Baby Birth Photography. L and B began care with me in the beginning of their pregnancy. 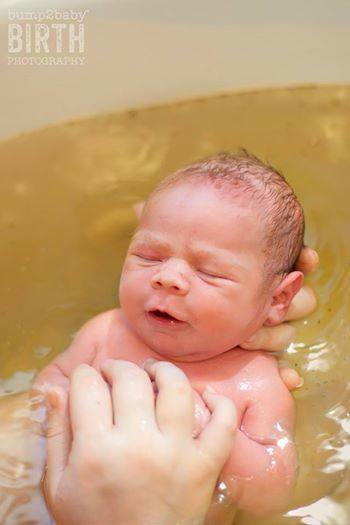 L had a birth center delivery with her oldest, and was desiring a home birth for this birth. This sweet little baby was team green, and everyone was excited to find out if baby was a boy or girl. The pregnancy progressed beautifully. In the third trimester, we could tell L had a lot of fluid, and this little trickster decided to go transverse at 34 weeks. L went in for an ultrasound, and baby stayed head down from 35 weeks until delivery. Early on January 12 at 38.3 weeks gestation, L called and stated her water had broken at 325am. L wasn’t having any contractions. I encouraged her to rest and as soon as she was rested to call me over and we would work on contractions. It wasn’t long that L called me back and said to go ahead and come since rest wasn’t happening. I arrived around 5:30. B had the birth pool blown up and ready for us to fill when it was time. L’s friend Z arrived. She began reflexology and using oils to encourage labor. Soon L’s doula arrived as well as the birth photographer. Such good, positive birth energy was felt amongst everyone. While Z was doing reflexology, I was giving L herbal tincture to encourage contractions. For the next couple hours we kept up this routine, with L bouncing on the ball and occasionally breaking to walk the stairs. Quarter to eight we decided to do a cervical exam and sweep membranes to see if this would help bring on contractions. L was 2cm dilated, 60% effaced and baby was at a -2 position. After the exam, L drank some red raspberry leaf tea and then we all went out to take her curb walking. It was a lovely morning to be out walking. After walking, L decided she wanted to lay down for a bit and try to take a nap. When she woke an hour later, L said she was feeling crampy. Progress! L bounced on the birth ball and drank more pregnancy tea. We all chatted on. It was a lovely early labor time, while we tried to get some contractions going. As 11am neared, we decided to do another cervical exam per L’s request. She was now 3cm/70%/-1. L went to her room to lay down, while her doula did some belly massage with essential oils to help encourage contractions. Thirty minutes later, L emerged from her room happy to state that she was now contracting every 6 minutes. They were short, but contractions were here! L alternated positions well for the next couple hours. She was on her hands and knees as her doula provided counter pressure. Then she would walk and rock her hips, then the stairs. All the activity was allowing regular contractions coming every 3 minutes, lasting 60 seconds. Still mild in intensity, but progress was being made with each passing minute. At 1pm, L asked if I would do another cervical exam. She was 4cm. I encouraged L what great change she was making and to look at the fact that we have been having contractions for a little under two hours. L continued on in her labor groove. She continually alternated positions, breathing well through each contraction. Then, things stopped. L had an unexpected visitor stop in that she didn’t want present for the labor and birth. It is amazing how much hormones work and hurt the labor progress. L sought refuge to her bedroom. We had a good cry, and then B went and had the visitors run a few errands for them. For the next hour, we worked trying to start contractions up again. Z did reflexology and we had oils being applied and being diffused. As 3pm drew near, L asked for another cervical check. She was 5cm/70%/-1 station. I swept her membranes again, and then talked to L about trying to get out of the house. Sometimes fresh air and a change of scenery does a mama- and a labor- good. L and B decided they would maybe go to the outlet mall and walk. Contractions picked up while they were out. They did not make it to the outlet mall. They walked around Target and picked out a first outfit for the baby. They arrived a little after 5pm. Contractions were every 4 minutes, lasting 60 seconds. L asked for another exam, and there was no change. There was some bloody show on the glove. We started the herbal tincture again. L’s demeanor changed and she was feeling more positive again. She decided she wanted to try the shower for a bit. It helped. Contractions definitely seemed stronger and were now 3 minutes apart, lasting 70 seconds. After the shower, L came out and ate some dinner, while Z worked on her feet. Then L decided to try a walk again. During the walk they decided to squat at every stop sign. The activity really seemed to help things along. At 8:40pm, we did another cervical check. L was 6cm/70%/-1. I was able to release a pocket of fluid with this exam. The first contraction after the check was noticeably different. A, my birth assistant, fixed the birth pool, while L labored on the toilet. Contractions were every 3 minutes, 80-90 seconds long and definitely strong. At 9pm, L got into the birth pool in the hands and knees position. She flipped to a squat, then hands and knees, then side lying. With every contraction, L moaned and rocked. The lights were dimmed and we surrounded L with support and encouragement. The pool seemed to help the contractions a great deal. The contractions spaced to every 5-6 minutes. Still strong, but not as often in the pool. Two hours passed and L got out of the tub. While out, she asked me to do a cervical exam. She was 6cm dilated, 90% effaced and baby was engaged at a 0 station. Phenomenal change. Contractions were back to every 3 minutes and were strong out of the tub again. We alternated doing the booty shake with L using the rebozo. Then she rested on her side. At 1130, she decided she wanted to get back into the birthing pool. She stayed in the pool about an hour. Again, contractions spaced. L decided to get out of the pool and move to her bedroom. L stood beside her bed, leaning and rocking with contractions. L looked me into the eye and said, “This baby is not coming out in the pool. The baby is going to be born here.” L was in hands and knees, then layed flat in the bed. Sleeping between contractions. As 1am drew near, L asked me to please do a cervical check. She was now 9cm dilated, 100% effaced and baby was at a +1 station. Everyone was so happy at what great change and prepared for mama to be ready to push soon. L began to squat beside her bed. The over bearing urge to push began at 1:25. B got on the bed to help hold L up as she pushed. Two minutes later, we could see the head as she pushed. A couple more pushes and sweet baby was earth side. We quickly discovered the reason why it took so much work to have a baby. Baby was born in the right occiput posterior (ROP) position. Stubborn little guy put his mama through a lot of work to bring him earth side. L was amazing. The strength and courage a woman has while laboring and birthing her baby leaves me speechless. Welcome to the world sweet baby Griffin! Born on January 13, 2014 at 130am, weighing in at 6.14# and 19.5″ long. It was a blessing to be part of your birthing day!